"Dr. Igor Laskowski is a board-certified vascular surgeon who specializes in the treatment of venous disease and has extensive experience in treating a broad spectrum of venous problems." 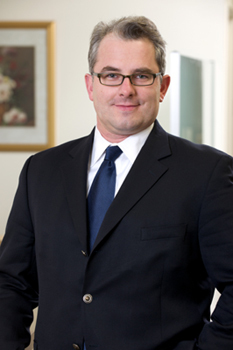 Dr. Laskowski is a board-certified vascular surgeon who specializes in the treatment of venous disease. He is a member of the Atrium Vein Center located in Westchester, a premier vein treatment facility that provides state-of-the-art treatments for patients with all types of vein disorders. Dr. Laskowski has extensive experience in treating a broad spectrum of venous problems. The scope of his practice ranges from cosmetic surgery for spider and reticular veins, to treatment of symptomatic varicose veins, venous reflux disease and chronic venous insufficiency, treatment of damaged perforating veins and therapies for leg swelling and venous stasis ulcerations. To ensure the best treatment results for his patients, Dr. Laskowski utilizes in his practice a wide range of therapies. Some of the offered treatments include sclerotherapy, laser ablation surgery, radiofrequency venous surgery as well as microphlebectomy procedures along with advanced compression therapy. All procedures are minimally invasive and virtually without scars and allow Dr. Laskowski to tailor his treatments to the individual needs of his patients. Dr. Laskowski is an assistant professor of surgery at the New York Medical College and the attending vascular surgeon at Westchester Medical Center. He completed his internship and residency in general surgery at Columbia Presbyterian Medical Center and his vascular surgery fellowship at New York Hospital Medical Center. He served as a research fellow at Harvard Medical School in transplant immunology and obtained a doctorate degree with distinction from Warsaw Medical University. He is an author and co-author of a number peer-reviewed publications, and he has presented his results in national conferences.